Apple is expected to unveil iOS 8 at WWDC 2014 in early June, but meanwhile plenty of reports have detailed some of the features it will have to offer, with various alleged image leaks showing what the new operating system would look like on a bigger iPhone 6 display. But iOS 8 will be compatible with older devices as well, and PhoneArena has obtained an image that shows iOS 8 running on an iPhone 5s. While it’s not clear whether the image is genuine, or how the leaker obtained a copy of iOS 8, other sites have reported steady iOS 8 sightings in website analytics, suggesting that Apple is already testing iOS 8 ahead of WWDC. In addition to old default iOS application, these pictures show some of the new iOS applications tipped to arrive with iOS 8, including Watch Utility, Healthbook, TextEdit, Preview, Tips and a stand-alone iTunes Radio application. Some of these applications have been featured in great detail in previous reports, especially the Healthbook app, which may be one of the most important additions to iOS this year. 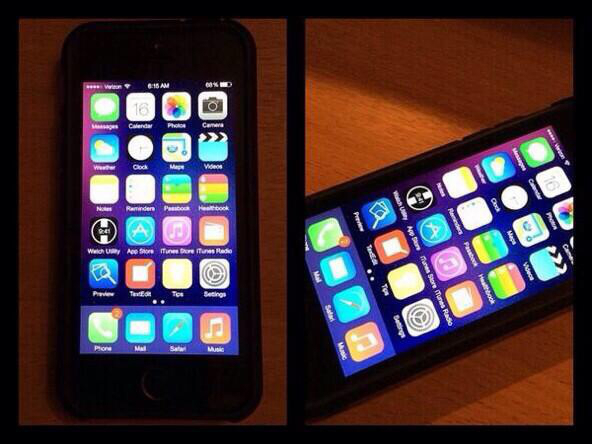 The images allegedly showing iOS 8 running on iPhone 5s follow bellow. UPDATE: 9to5Mac‘s Mark Gurman, who has a strong track record reporting iOS leaks, seriously doubts this image is genuine.